I am not often short of words, but on this occasion I need one more than I have. I have finished the column on the right hand side that was nearly there last time I posted. And started to work with the remaining three birds, which need to go over on the left. If you look at the picture above and then the one below you will see that my first step was actually to chop a load of stuff off one of my little blocks. I didn't dislike it, but just couldn't get things to balance properly and decided that a rethink was in order. This was partly because I had quite a clear idea of where I want the words in this column to fall and that big chunk was just making it impossible. Taking it back to a smaller shape gave me much more room for manoeuvre. I also ended up shifting the birds around for the umpteenth time. I'm done now though: this is where they will be staying. Now I need to print one more word, to go in that gap. Linking up Off the Wall Friday. Love the happy feelings this piece is evoking, it just shines! Looks good. Triangles are fun! I love the way you put your quilts together and the end result. Very innovative. This is yet another amazing quilt. 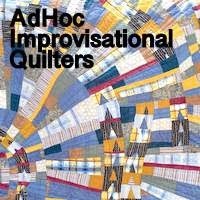 I love seeing the way in which you grow your quilts. Very pretty! I love all the cheerful yellow and your stamped words! I love this quilt so much! Every time you add another section is just gets better and better. That quilt just makes me smile! It needs only accompanying bird song ..... oh hang on.....I can almost hear them chirruping! Very well travelled birds! I can't help but think that int the Norther hemisphere bloggers will surely be thinking of the summer months when they see this quilt. Eagerly waiting here for the final word.